Create Edit Decision Lists - EDLs - from Final Cut Pro X XML files. The EDLs conform to the CMX 3600 standard and can be used to bring your cut into post production systems like DaVinci Resolve, Smoke, etc. This is what an EDL looks like. It's machine-readable by some post production hardware and software. It lists edits, or events, sequentially. Each event has at minimum an event number, a source reel number, a mode (here 'C' for Cut) and 4 timecodes for source in, out and record in, out. An EDL file can be looked at and edited in a text editor. A link to the CMX 3600 standard for EDLs is on the support page. This example uses the 'Strict' list format. Display Color Space Information in EDLs. Partial mutes of audio components are now reflected in EDLs. Source channel info for clips with default roles and audio configurations. New footers show the EDL list type (Strict, Single List without and with Video Track Numbers), EDL-X version and a date. If available in the XML, the date shown is the project's modification date, otherwise the time of processing in EDL-X. This effectively suppresses default roles. 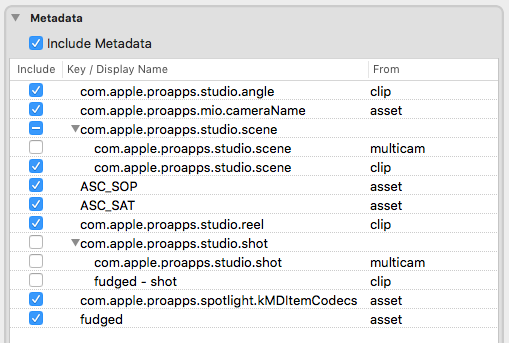 Support for XML 1.6 from Final Cut Pro 10.3. EDL-X remains compatible with XML from previous versions of Final Cut Pro. Updated support for Roles, including Role-Based Audio Components. Show Audio Source Tracks and Channels in the EDL. If Role information is entered in Final Cut Pro the new XML format allows for audio source channel parsing. Audio source clips with multiple channels can have multiple tracks, and each track can have multiple channels. In the EDL either channels or a combination of tracks and channels can be shown. Even a combination of these two options is possible. New EDL format: CMX 3600 Single List, with unlimited video and audio tracks. Strictly adhering to the CMX 3600 format, EDLs can have no more than one video track, and no more than four audio tracks. This means that separate EDLs have to be made when there is a need for more tracks. Using the EDL format 'Single List', one single list can reflect all video layers. Using the Strict list format, the project shown here would need at least 6 separate EDLs, one for each video track. Video events can overlap each-other. Optionally, video tracks can have numbers. Audio tracks are numbered counting up, like this: A1, A2, A3... A19, etc. While EDL-X is not the only application to make Single List EDLs, compatibility with other software packages is not guaranteed. Transform XML time values to decimal seconds and a quasi-time code. To increase human-readility of the XML displayed in EDL-X, more easily readable time values can be added to the text. For example, this XML snippet: offset="38818400/9600s" gets converted to: offset="38818400/9600s (01:07:23.583 - 4043.583)". The original value represents seconds, expressed as a fraction. The first added value is a 'decimal seconds time code', where the the first 6 digits are the usual hours, minutes and seconds. The last three digits show a fraction of a second, expressed as a decimal number. The last added value represents the number of seconds as a decimal number. Incidentally, Final Cut Pro can display this type of number in its user interface when you select Seconds for Time Display in the General Preferences. Note that the decimal seconds are rounded to 3 post-decimal-point places. The transformed XML can be saved to a text file, and is still compatible with EDL-X. Improved visual display of EDLs. Events in the list have alternating background colors for better readability. Drag and drop projects straight from FCP X 10.3 into EDL-X. Audio events from media with certain audio configurations are combined into single events per source. Previously, for clips from media with multiple audio tracks each track was shown separately in the EDL, while clips from media with a single track and multiple channels were shown as single track in the EDL. In EDL-X v2.3 all audio channels from a clip, regardless of the track configuration, are treated as a single source. Streamlined internal processing due to new FCP XML format. Changes to FCP's XML format prompted changes in the internal workflows of EDL-X. Some of those changes require more processing than before, but also provided an opportunity to accelerate some of it. Role Filtering: control what footage is included based on Roles and Sub-Roles assigned in FCP X. List Effects including some parameters and keyframes. EDL-X groups all video and audio clips into as few tracks as possible. Using the 'CMX 3600 Strict' list format, each video track gets its own EDL, with synch audio in the same EDL. Source names can be read directly from the FCP XML file, or from the QuickTime files used in the project. Alternatively, media file names, or full file paths can be used. Source names can be made to conform to strict CMX standards (three numbers), or 8, 16, 32 or unlimited alpha-numerical characters. Each EDL includes a source table, allowing for easy tracking of any name conversions. All source names are user-editable, on a per-source basis. The Sources listed in the Sources Tab can be saved as tab-delimited text. EDLs can show metadata, including ASC CDL color grading information, like seen below. Metadata are shown as comments in EDLs. The XML is scanned for metadata items. The result gets listed in the Prefs tab, so that items can be selectively listed in the EDL. Drag and drop XML files to create EDLs. EDL-X supports reading source reel information from XML files exported from FCP X.
Markers and Clip Notes can be reflected in EDLs. EDL-X can be used as a Share Destination straight from FCP X's Share menu. This means that an XML file doesn't have to be explicitly saved to disk any more, and sequences/cuts/projects can be made to EDL-X from FCP X in a single step. EDL-X now install a Final Cut Pro X Share Destination, so that XML can be sent directly to EDL-X. Using these two features, EDL-X can be set up to make and save EDLs in one single step, starting in Final Cut Pro X. The Preferences in EDL-X are pretty self-explanatory. Click the image above to see them all . EDL-X v2 runs on Mac OS 10.10 and newer. It requires Final Cut Pro X to export your edited project as XML files. EDL-X is available on Apple's Mac App Store.